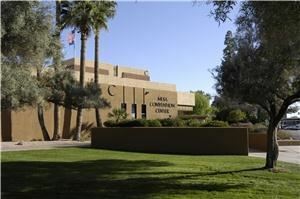 The Mesa Convention Center is located in the heart of downtown Mesa, AZ. We are a full service conference and exhibit center offering 15 various sized rooms. The largest features 15,000 sq ft of exhibit space with an additional 3,090 adjoining space for b/os or function. Full service a/v, decorating, and catering is available. Parking is complimentary. The Phoenix Marriott Mesa Hotel is located adjacent to our property with 275 guestrooms and additional meeting space. Beautiful Mesa Amphitheatre is on-property for concerts or special events. Spring Training home of the Chicago Cubs. Beautiful outdoor Amphitheatre can hold up to 4,950 guests. Built in stage, loading dock, green rooms, and meet and greet area. Full concessions run by on-property caterers, Ovation Foods. Atmosphere/Decor: Outdoor Amphitheatre offering capacity for 4,950 on grassy tiered rows. Built-in stage area with full loading dock (semi truck), green rooms, dressing rooms, and meet and greet area. Special Features: Beautiful manicured tiered grass seating. Special Features: The Mesa Convention Center features 15 various room sizes in three one-story buildings. It is located 15 miles from downtown Phoenix. Full service offering catering, a/v, decorating as well as event coordination.